A vinyl fence could be a great addition to your property! Are you shopping for a new fence? With all the various options on the market, it can be overwhelming and even confusing to decide which type you should buy. If you are unsure and don’t have any guidance, you could end up making an investment into a fence that won’t withstand the needs of your property or the climate in which you live. 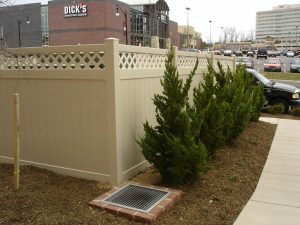 To help keep you informed about all your options, here are four advantages of choosing a vinyl fence. It could be the right choice for you. Vinyl is an incredibly strong, durable, yet flexible material. When compared to wood, it’s nearly five times as strong. This factor, when combined with its flexibility means that this material is great for withstanding the forces of harsh weather, including strong winds and rain. Vinyl is also especially useful on seaside locations as it is suitable for saltwater exposure. You’ll enjoy a low maintenance routine when you install vinyl fencing. It just requires periodic cleaning with a simple mixture of warm water and soap. You’ll also notice that constant sun exposure does not affect the color, which means that you won’t have to repaint vinyl to maintain its looks. Because it’s not a natural material, it’s not susceptible to rotting or termite damage like wood fences. There’s also no need for primer or other protectants as it won’t rust from moisture exposure. Although vinyl is not a natural material, it’s also not toxic, making it safe for use around your children and pets. Its non-toxic characteristics also make it better for the environment. This material is made from 51 percent chlorine (derived from salt) and 49 percent hydrocarbons (derived from natural gas). Vinyl is also a recyclable material, which greatly reduces waste during the production process. If you’re handy, you might be able to skip on having the fence professionally installed, because the installation is so easy to do. The rails slide easily into the posts before being secured to the ground. This also means that making repairs will be easy to accomplish if you find yourself needing to replace any of the posts. No matter what type of fence you have decided on, Hercules Fences has the expertise and equipment to construct your dream fence. Our experienced team can help meet your fencing needs, whether they are residential or commercial, for the right price. Give us a call at 804-752-7992 or visit us online. To see examples of our work and keep in touch, don’t forget to follow us on Facebook, Twitter, Google+, LinkedIn, Flickr, and Pinterest. This entry was posted on Wednesday, March 7th, 2018 at 9:34 pm. Both comments and pings are currently closed.